Today, April 30th, marks exactly 40 years since the largest helicopter airlift in history took place. It was designated Operation Frequent Wind. 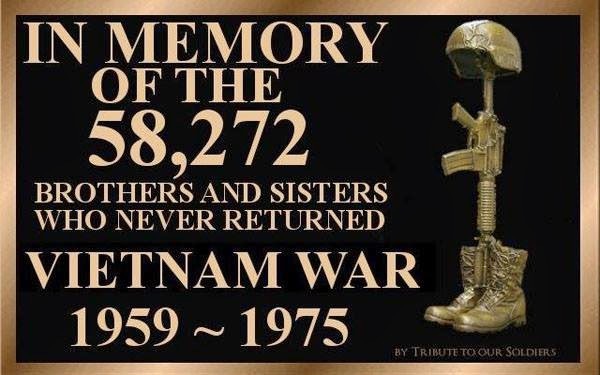 April 30th, 1975, was the last day of Vietnam War. And yes, Operation Frequent Wind would go down as history's largest helicopter evacuation ever to take place. 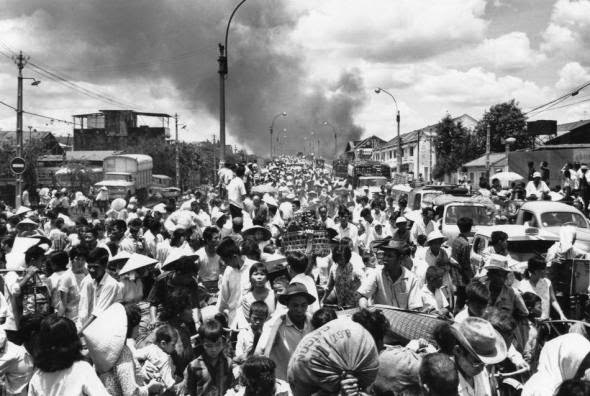 It would become a time and date which witnessed over 7,000 South Vietnamese flee Saigon for their very lives. Before the Operation, we were told that 150,000 North Vietnamese Communists troops were just outside Saigon South Vietnam ready to pounce. Just a few weeks earlier, we were conducting Operation Eagle Pull which was the evacuation by air of Phnom Penh, Cambodia. At the beginning of April 1975, Phnom Penh, one of the last remaining strongholds of the Khmer Republic, was surrounded by the Khmer Rouge and totally dependent on aerial resupply through Pochentong Airport. With a Khmer Rouge victory imminent, the US government made contingency plans for the evacuation of American nationals and allies to get them out by helicopter to ships in the Gulf of Thailand. Operation Eagle Pull started on April 12th 1975, and is said to have been a tactical success carried out without any loss of life. It was just 5 days later that the Khmer Republic collapsed and the Khmer Rouge occupied Phnom Penh. By the end of the month, we were preparing for another evacuation, but this time it would be Saigon South Vietnam. On April 12th,1975, the 2nd Battalion, 4th Marines (2/4) which was aboard USS Hancock took part in Operation Eagle Pull, the evacuation of Americans from Phnom Penh, Cambodia. By the end of April, Marine Battalion Landing Team (BLT) 2/4 would take part in Operation Frequent Wind and the evacuations of Saigon. As strange as it sounds today, back then we all knew when the Operation was to start. The signal was when American Forces Radio broadcast Bing Crosby's "White Christmas" on the morning of April 29 and announced "the temperature is 105 degrees and rising." That was the signal. Americans and hand-picked Vietnamese began heading toward predetermined assembly spots. With that Operation Frequent Wind was on, and soon it seemed that choppers were everywhere. Again and again, and again, and again. All day and all night long, choppers came and went to grab up as many as can be had. Yes, I remember the choppers and the scores of South Vietnamese who were fleeing a land about 30 minutes away. Aboard the USS Hancock, as with other ships, Marines were assigned to maintain law and order as the refugees into our ships. We Marines met each chopper's landing with our M14s locked loaded with fixed bayonets. We were told that North Vietnamese and Viet Cong were trying to get aboard the U.S. Navy ships to reek havoc and preform sabotage. Wounded and hurt were taken to a sick-bay setup in one of the ready-rooms on the flight deck. There they would be tended to included deloused. Marines searched men, women, child, and anything they brought aboard. There Arms were confiscated and thrown overboard. But of course, that wasn't the only thing thrown overboard. When it became apparent that the flight deck was too crowded with Hueys, they too were soon pushed over-board. In Saigon, it was said that chaos ruled the capitol of South Vietnam. People feared for their lives as the Communist overrun of the city became imminent. Supposedly from what I was told much later, the original plan called for most flights to arrive and depart from the U.S. Defense Attache Office near Tan Son Nhat airport. Marine Corporal Charles McMahon and LCpl Darwin Lee Judge were the last two United States servicemen killed in Vietnam during the Vietnam War. The two U.S. Marines were killed in a rocket attack one day before the Fall of Saigon. On April 28th, Tan Son Nhut Air Base which was adjacent to the airport came under artillery fire and attack from Vietnamese People's Air Force aircraft. The fixed-wing evacuation was terminated and Operation Frequent Wind commenced. The evacuation took place primarily from the Defense Attache Office (DAO) compound, beginning around 14:00 on the afternoon of April 29th, and ending that night with only limited small arms damage to the helicopters. The U.S. Embassy in Saigon was intended to only be a secondary evacuation point for embassy staff, but it was soon overwhelmed with evacuees and desperate South Vietnamese. Also it is said that as word of the evacuation spread, thousands upon thousands of South Vietnamese began heading to the American embassy compound. There, crowds jammed the gates, some holding papers claiming they had worked for the Americans. Others said they were dependents of American citizens. Many rightfully feared their U.S. connections would put them in danger under a Communist North Vietnamese government. I was told later that the Embassy Marines chose who to let inside, and who not to. Those trying to get out knew about the coming massive arrests, the Communist "re-education" camps, and the on-the-spot executions at the hands of the Communists. Thousands of Americans and their Vietnamese family members wondered how -- or even if -- they were going to safely escape to freedom. Saigon was actually beyond chaos. It was if a tsunami of frightened people descended upon our embassy all trying to evade the Communist wrath. U.S. helicopters that shuttled back and forth between the fleet and Saigon that day, included Marine CH-53, CH-46, CH-47, Hueys, and even HH-53 Air Force choppers. Air America, the CIA air service in Vietnam was also shuttling evacuees out. In there case, those pilots had the task of landing on unfamiliar rooftops and openings throughout the falling city to pick-up unknown evacuees and flying them to staging areas or our Navy ships offshore. If I remember right, among the first choppers to start the evacuations were the Air America choppers. I think I will always remember those silver and blue civilian versions of the famous UH-1 "Huey." Marines choppers didn't start their chopper airlift until the afternoon. Of course besides Marine helicopters and Air America choppers, there were South Vietnamese pilots who decided to make their own dash for freedom during the evacuations. With the collapse of South Vietnam, VNAF helicopters and even some fixed-wing aircraft flew out to try to get to the U.S. evacuation fleet. Some South Vietnamese pilots commandeered helicopters and flew offshore to meet our fleet leaving everything behind. And yes, as seen in the picture below, believe it or not, some even ditched their choppers near our Navy ships and swam the rest of the way. Many South Vietnamese choppers that were able to land on deck were pushed overboard because of a lack of space. 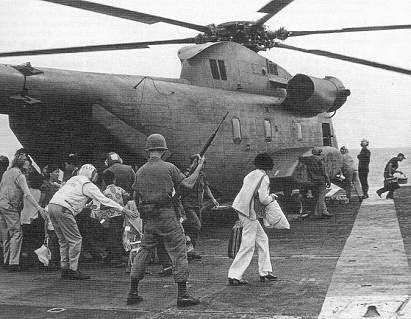 When a huge, South Vietnamese Chinook helicopter landed aboard the USS Hancock, we Marines joined the sailors to push it over the side. It was a horrible site and the noise that the Chinook made when it scraped the USS Hancock as it fell into the ocean with a huge splash was incredible. 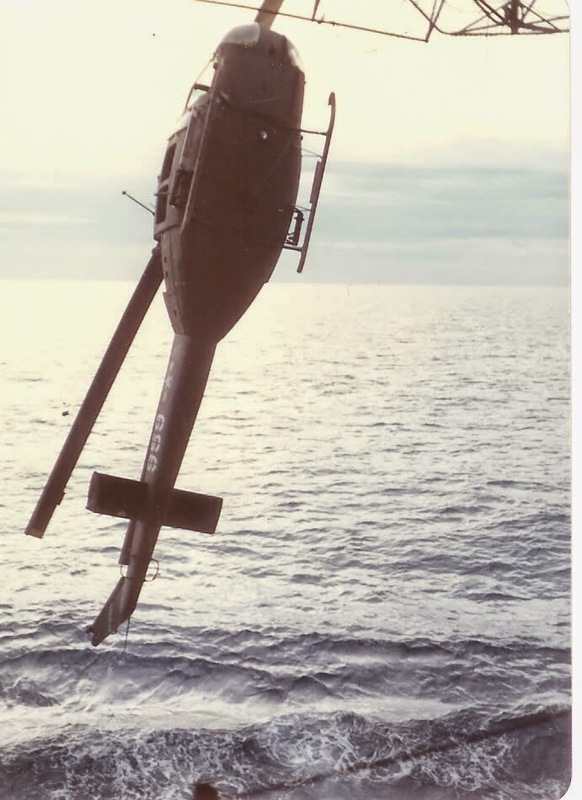 Talking with a friend the other day, a man who was an Army door-gunner about choppers in Vietnam in 1968, I was a little surprised that he did not hear about our ships having to pushing choppers overboard when helicopters threatened to take too much space. During that night, South Vietnamese helicopters waiting for permission to land started running out of fuel and simply fell out of the sky. One Marine chopper that went down was a Sea Knight with the call sign YT-14. It crashed into the water while approaching the USS Hancock. Yes, there was a big bright flash and it seemed that flares were going off would mark their spot. Then the flares died out. My Marine brothers had crashed and were lost at sea. And yes, with them, YT-14 was the final U.S. helicopter lost in Vietnam. By the time it was over, about 100 Marine, Air Force and Air America choppers had evacuated an estimated 7,000 Americans and South Vietnamese out of Saigon. It should be noted that during the Fall of Saigon, the 2nd Battalion / 4th Marine Regiment was the last Combat Unit to see action in Vietnam. Elements of BLT 2/4 were landed at the DOA Compound where at the DAO Compound received small arms, mortar, and M79 grenade fire from ARVN forces. 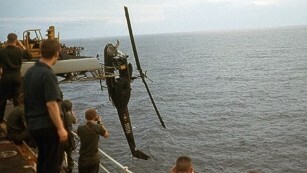 After sunrise, the USS Hancock sent out a final chopper to rescue 11 stranded Marines on the Embassy in Saigon. The chopper set down on the Embassy's rooftop helicopter pad and after surviving the night uninjured, all 11 Marines ran aboard. One of the Marines marked the time on his watch. It was 7:58 a.m., April 30, 1975. Embassy guard Marine Master Sgt. Juan Valdez was the last American to leave Vietnam. The world's largest helicopter airlift was history. A few hours later, North Vietnamese tanks smashed through the gates of the Presidential Palace. Saigon would be renamed Ho Chi Minh City. For the record, tens of thousands of Vietnamese evacuated themselves by boats and ships in the coming months and years. Communist Re-Education Camps set up to indoctrinate the South Vietnamese to the rule of the new Communist State are said to still be in effect today. A report out of Vietnam in 1985 reported that of those people which the Communist felt could not be "re-educated" over 2.5 Million were slaughtered in those camps. As for the deaths of Marines Cpl. Charles McMahon and LCpl. Darwin Judge, both Marines were members of the Marine Security Guard (MSG) Battalion at the US Embassy in Saigon for a short time before being killed in action. Corporal McMahon had arrived in Saigon on April 18th, and Lance Corporal Judge had arrived in early March of that year. In accordance with procedures for deceased Americans in Vietnam, their bodies were transferred to the Seventh Day Adventist Hospital, nearby Tan Son Nhut airport. In telephone calls to the hospital on the afternoon of April 29th, the few remaining staff advised that the bodies had been evacuated when in fact the bodies were left behind. Through diplomatic channels, the U.S. government secured the return of their bodies the following year. Lance Corporal Darwin L Judge was buried with full military honors in March 1976 in Marshalltown, Iowa. There was a flag draped coffin, a Marine Honor Guard, and a rifle firing salute. The flag that covered his coffin was folded and presented to his parents. It is said that his funeral was so ignored that major and minor media did not attend the event. The lone exception being the Daily Iowan (Iowa City, Iowa). Due to ignorance of his military funeral in March 1976, Lance Corporal Judge was given a second Marine burial honors 25 years later. Cpl McMahon and LCpl Judge names will be tied together forever as the last two Marines killing in action in Vietnam. By the beginning of May, the USS Hancock had off-loaded BLT 2/4 and then arrived in Subic Bay, Phillippines to off-load the refugees it carried. Now, lastly, the "Mayaguez incident" took place between the Kingdom of Cambodia and the United States from May 12th to the 15th, 1975, less than a month after the Khmer Rouge took control of the capital Phnom Penh. U.S. Marine contingent aboard the USS Hancock did not arrive until May 16th. By then, Washington had halted the operation. The taking of the merchant ship S.S. Mayaquez and its American crew by Khmer Rouge pirates was the cause of the subsequent battle at Koh Tang Island that followed. The battle of Koh Tang Island is the last official battle of the Vietnam War. Of that last battle, 15 U.S. Marines were killed in action, 50 wounded, another 23 Marines were killed en-route in a helicopter. Some say the helicopter was shot out of the sky, some say it was engine failure. And yes, 3 Marines were left behind and executed. The 3 Marines left behind are listed as missing in action but presumed dead. The names of the Marines killed, as well as those of the three Marines who were left behind on the island of Koh Tang after the battle and were subsequently executed by the Khmer Rouge pirates, are the last names on the Vietnam Veterans Memorial. May God Bless them and the other more than 58,000 American troops who died in that war. Present aboard USS Schofield DEG-3 for evacuation and Mayaguez Incident. End of an era. Many memories and so many tales left untold. Thanks for adding your part of the immense story that recedes in the past as time marches relentlessly forward.